Don't you think chess is as brutal as boxing? Look at this knockout chess video that has already gone viral on the Internet. 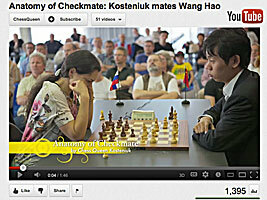 It stars none other than Chess Queen Alexandra Kosteniuk and Super-Grandmaster Wang Hao. Click on the photo.